The UK headline inflation rose decelerated to 1.8% over the year in January. The core inflation stripping the consumer basket off food and energy prices rose 1.9% over the year. While oil price drop keeps headline inflation lower, the housing and household services contributed by 0.43% to the annual rise. With inflation below the target focus of the policymakers at the Bank of England is glued on Brexit development. The UK headline inflation rose 1.8% over the year in January, missing the market estimate of 1.9% y/y increase, the Office for National Statistics said on Wednesday. The core inflation stripping the consumer basket off the food and energy prices remained stable rising 1.9% over the year in January in line with the market estimates. The largest downward contribution to the annual change in headline inflation came from electricity, gas and other fuels, with prices overall falling between December 2018 and January 2019 compared with price rises in January 2018. 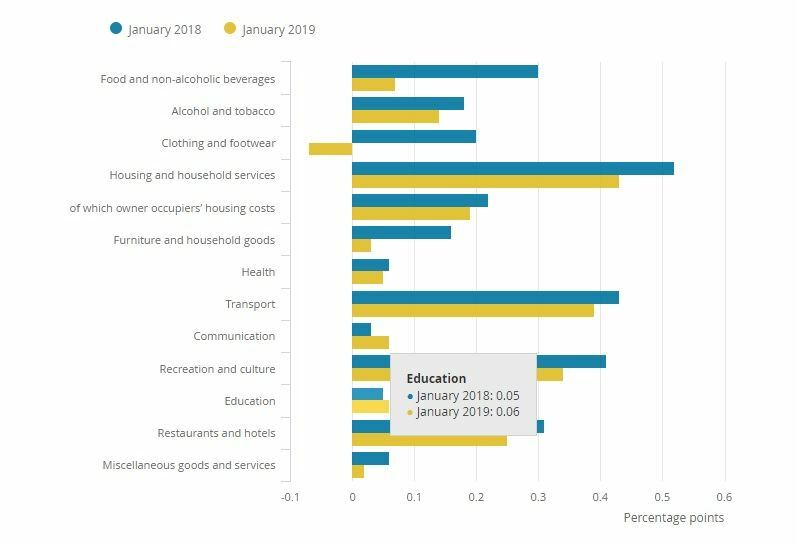 The largest upward contributor to the UK headline inflation came from housing and household services, with prices rising by 1.4% on the year in January. The annual contribution of this category though reduced to 0.43 percentage points, from 0.62 percentage points in December 2018. From the monetary policy point of view, the inflation dropped below the targeted 2% annual rise in January and therefore remains off the radar. For the Monetary Policy Committee (MPC) at the Bank of England though, what matters more is the inflation outlook and the inflation expectations going beyond 2019. In this perspective, strong UK wage growth is of greater importance as it remains fundamentally the most upwards pressing force in the UK economy. This has also been the point the Bank of England made in its February release of the Inflation report. “Demand growth exceeds the subdued pace of supply growth and excess demand builds over the second half of the forecast period. As a result, domestic inflationary pressures firm, as the upward pressure on inflation of Sterling's past depreciation wanes,” the Bank of England wrote in February inflation report. Due to increased wage pressures, the Bank of England is still en route to deliver a rate hike later this year once the Brexit uncertainty wanes. “An ongoing tightening of monetary policy over the forecast period, at a gradual pace and to a limited extent, would be appropriate to return inflation sustainably to the 2% target at a conventional horizon,“ the Bank of England February monetary policy statement concluded.